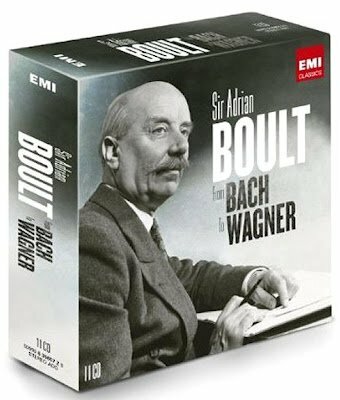 In a preface to the original 1974 LP release of his recordings of Bach's Brandenburg Concertos Sir Adrian Boult expressed the hope that they would “take our audience back to the Bach of 1900, to the smooth and solid expression given by a far larger orchestra than Bach could ever contemplate, and those who prefer the delicate staccato interpretations of the sixties will have no difficulty in finding many excellent records in this vein”. However, despite the recordings being made with the London Philharmonic Orchestra, they are not big band Bach in every respect; recorders are used in the First and Fourth Concertos and a harpsichord provides the continuo throughout, although I recall being told by session producer Christopher Bishop that the latter choice at least was his, rather than Sir Adrian’s. This still deliciously inauthentic Bach has been out of the CD catalogue for far too long, but now returns in the “don’t think, just buy” eleven CD EMI box seen above. Currently retailing for £21.42 on Amazon, it also includes priceless recordings of the Brahms Symphonies and Schubert’s Great C major. Sir Adrian’s Bach is just more evidence that authentic performances are a silly convention. Gavin, it is truly a box of delights. It is not that authentic performances per se are 'silly'. What is 'silly' is the view that anything other authentic interpretations - Casals' Brandenburgs with Eugene Istomin on piano in number five for instance - is heretical.